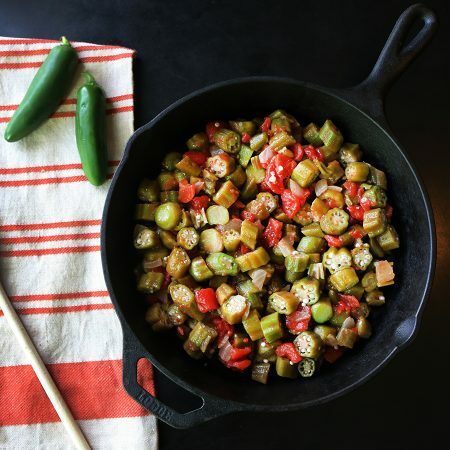 Spice up your meals with this unique and flavorful okra recipe. Slice rinsed okra crosswise, cut into 1/2″ to 1″ slices. Heat oil in a heavy skillet over moderately high heat. Saute onion for about 3 minutes. Add tomatoes (including juice) and chile, and bring to a boil. Stir the mixture for 8 minutes. Add okra and cook, gently stirring until okra is tender, about 5 minutes. Stir in salt and pepper and discard the chile. A can of low sodium, diced tomatoes can be substituted for the fresh. Like it spicy? Instead of piercing the chili cut it up, seeds and all, and add to skillet with tomatoes.